Published by Gill and Macmillan, Strumpet City depicts a pivotal event in Irish social history – the mass lockout of trade unionists by employers in 1913 – and has a wonderfully memorable cast of characters – not least the city itself. One reviewer commented – “if Ulysses is Dublin’s odyssey, Strumpet City is Dublin’s epic”. The same reviewer is of the opinion that if anyone is seeking the Great Irish Novel – they need look no further. From the destitution of Rashers Tierney to the solid, aspirant respectability of Fitz and Mary, the priestly life of Father O’Connor, and the upper-class world of Yearling and the Bradshaws, it paints a portrait of a city of stark contrasts, with an urban working class mired in vicious poverty. Strumpet City is the great, sweeping Irish historical novel of the 20th century. James Plunkett Kelly was born in Sandymount in Dublin in 1920 and was educated by the Christian Brothers at Synge Street. He began writing short stories as James Plunkett in the 1940s, many of which were published in The Bell. 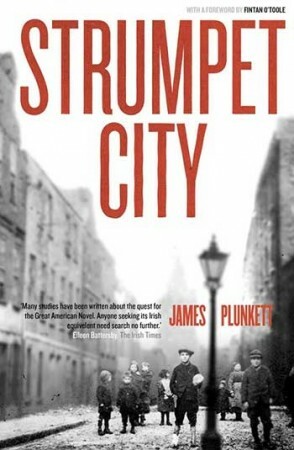 First published in 1969 while Plunkett was working as a producer at Radio Telefís Éireann, Strumpet City is acknowledged as his masterpiece. It was later made into a popular television series starring Peter O’Toole, Bryan Murray, Donal McCann, Cyril Cusack and David Kelly. Plunkett drew on his city centre working-class background as well as his experience in the labour movement as inspiration for the book. While working as a clerk in the Gas Company, he became active in the Workers’ Union of Ireland. In 1946 he became branch and staff secretary and worked under Jim Larkin until Larkin’s death in 1947. Plunkett also wrote three radio plays, including Big Jim, also set in the 1913 Lockout in Dublin. It provided the basis of the stage play The Risen People, produced by the Abbey Theatre in 1958. He died in 2003.